Communication strategies will be the topic for the next few posts. You will find case scenarios taken from recent Be Direct with Respect® workshops. Have you dealt with any of the following issues? A colleague didn’t receive a promotion and you don’t know what to say. You want to tell a productive direct report that she needs to develop a couple of skills. A friend is dwelling on how he was passed over a promotion. You want to suggest that he moves on in order to look for more opportunities and not be so negative. This article has 2 communication strategies to help you support a friend, colleague or direct report. Make the conversation safe by starting it out with I do want – I don’t want. I don’t want to minimize the effort that you are making. I do want to discuss how to improve your performance. I don’t want to discourage you. I do want to help you with your career. I don’t want to dwell on what didn’t happen. I do want to encourage you to look at this as an opportunity to refocus on career development. I don’t want to lose you as an engaged member of our team. I do want to discuss efforts to improve your future opportunities. I don’t want to downplay the importance of what the promotion meant to you. I do want to remind you of your strengths and all the things you bring to the team. I hope that you get the idea. You can make the conversation safe by using this strategy. You can also change the words around by using I don’t want at the beginning or start out with I do want. Everyone’s comfort level is different. 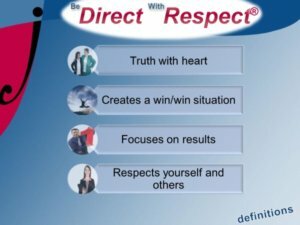 Be direct with respect® is a powerful communication strategy that allows you to be direct in a respectful way. It is a learned skill; a willingness to risk rejection by communicating directly, yet gently. It deepens relationships and resolves issues. I am concerned when I see you so down about not getting promoted because I believe you can get past this and achieve your goals. I am concerned when I see your frustration because you can move forward in the organization. I understand your situation when I see you disappointed because I want to see you keep going in the right direction. These 2 communication strategies will give you a plan on how to approach this delicate subject with someone who may need some support. Find more communication strategies in the search option of this blog. Add a comment to my blog on how you have helped someone who didn’t get a promotion. Let me know what other communication or conflict resolution topics you want me to write about to fit your specific needs. You will receive a response from me because I enjoy connecting with my readers! 🙂 You are always welcome to send me a private email HERE with concerns that you are experiencing at work. Loyal readers like you help us find more people who could benefit from these posts. Help us help them reduce conflict and improve leadership skills and quality of life. Learn how I can leverage my 30+ years of leadership consulting and coaching experience to help your organization address conflict resolution in the workplace here.